The BlackBerry Enterprise Server Express is designed to be a secure, centralized link between an organization's wireless network, communications software, applications, and BlackBerry devices. The BlackBerry Enterprise Server Express integrates with your organization's existing infrastructure, which can include messaging software, calendar and contact information, wireless Internet and intranet access, and custom applications, to provide BlackBerry device users with mobile access to your organization's resources. 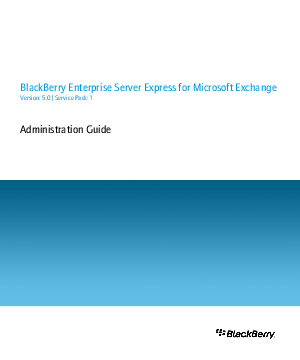 You can install the BlackBerry Enterprise Server Express on the same server as Microsoft Exchange or Windows Small Business Server, or you can install the BlackBerry Enterprise Server Express on a separate server. The BlackBerry Enterprise Server Express supports BlackBerry devices that are associated with a BlackBerry Enterprise Server or the BlackBerry Internet Service.